Ever seen a fungus hatch? Yeah, we hadn’t either, and it’s unnervingly strange. 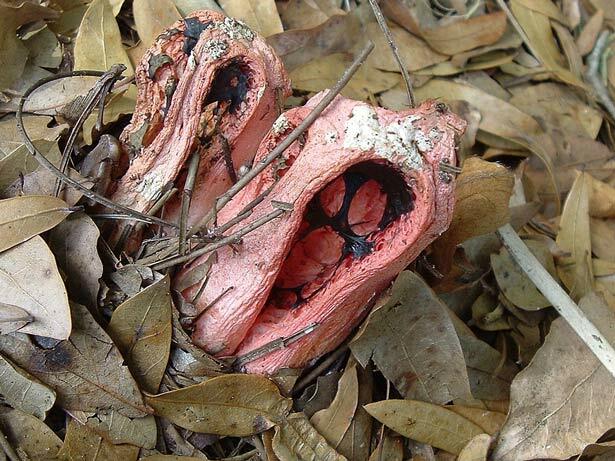 While this crazy organism looks better suited to life on Proteus than Earth, the devil’s finger fungus (Clathrus archeri) is Native to Australia and New Zealand. It typically appears as a white, gelatinous orb, but when it comes time for fruiting, the fungal ‘egg’ opens, unleashing four to eight blood-red arms (and likely a pinch of doom) on the world. While unappealing to us humans, what you’re seeing is actually a rather ingenious method of reproduction. The tentacles are laced with a foul smelling tissue, specially formulated to attract flies and other insects. When bugs come-a-knockin’, they get to feed on the slimy substance, but not before their feet are coated with fungus’ spores. It’s a tactic also used by many stinkhorn fungi, which (like the devil’s finger) belong to the order phallales. Once the insects leave the area, they bring the precious spores with them, and thus the lifecycle can start anew. Some commenters have asked if the devil’s finger is safe to eat. The answer surprisingly, is, yes – but their gelatinous nature is rumored to make the experience rather unpleasant. That doesn’t mean you should eat any ‘hatching’ fungus you see. A closely related species, Clathrus ruber is known to cause convulsions and vomiting when ingested…but thankfully not chest-bursting.